Using his own film criticism as a starting point--everything from his infamous dismissal of the international blockbuster The Avengers to his intense affection for Pixar's animated Ratatouille--Scott expands outward, easily guiding readers through the complexities of Rilke and Shelley, the origins of Chuck Berry and the Rolling Stones, the power of Marina Abramovich and 'Ode on a Grecian Urn.' 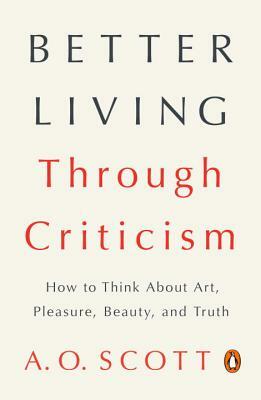 Drawing on the long tradition of criticism from Aristotle to Susan Sontag, Scott shows that real criticism was and always will be the breath of fresh air that allows true creativity to thrive. "The time for criticism is always now," Scott explains, "because the imperative to think clearly, to insist on the necessary balance of reason and passion, never goes away." A. O. Scott joined The New York Times as a film critic in January 2000. Previously, Mr. Scott was a Sunday book reviewer for Newsday and a frequent contributor to Slate, The New York Review of Books, and many other publications. He has served on the editorial staffs of Lingua Franca and The New York Review of Books. In addition to his film-reviewing duties, Mr. Scott often writes for the Times Magazine and the Book Review. He lives with his family in Brooklyn, N.Y.